Salach Baradwill, one of the Hamas heads in Gaza, rejected the conditions set down by Azzam el-Ahmad, member of the Fatah Central Committee for joining the Palestinian National Council. 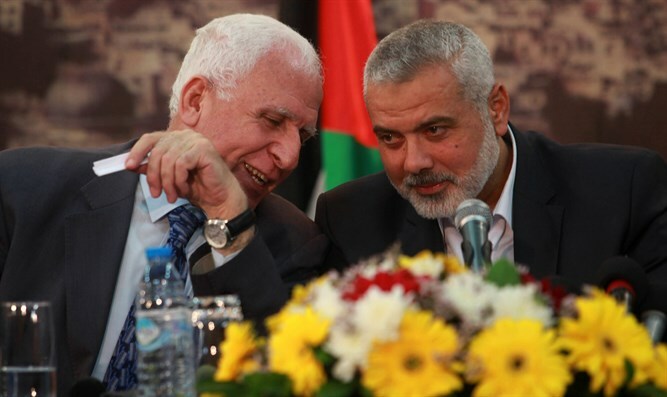 Azzam said that before Hamas and Islamic Jihad's joining the Council, those organizations must agree to implement political agreements with Israel, and the establishment of a national unity government. Baradwill responded that assembling the Council must occur within the framework of implementing all previous agreements between the Palestinians themselves, and the establishment of a temporary joint leadership with Hamas and the Jihad. Hamas, who in the past saw Fatah as an enemy, seeks today to integrate into Fatah institutions in order to take over from within and in this way achieve international recognition as the exclusive representative of the Palestinians.